Thursday ended up with me being extremely ill for some unknown reason. I made myself miso soup for dinner and Jen had leftovers. Neither of these things were noteworthy enough for pictures or descriptions. Due to the healing properties of the miso soup I was in tip top shape by Friday evening where we cleaned out much more of the leftovers from the fridge. We also spent the afternoon driving around and looking into purchasing a gas grill which we ended up not doing which is probably for the best since owning two grills while still living in an apartment seems a tad excessive. Saturday we went out to discover, much to our amazement, that we could get the best table in the best restaurant in our city at 7:00PM on a Saturday night! It's great to live in a city where you're the poorest resident. It means that while everyone else is out partying on their yachts for the long weekend you get the run of the town! I can't wait until Labor Day! On Sunday we visited friends upstate in an adorable little town where we sat around and drank mojitos while one of our friends did yard work. We are great friends. I started by soaking and grilling a mess of corn on the grill. 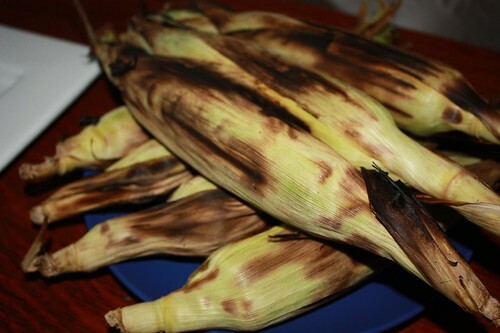 My new thing is eating grilled corn plain with no butter, salt, or pepper. For some reason I find this delicious, something that certainly would have been a cause of great sadness when I was a younger man. I got a couple of racks of pork ribs and defrosted a sirloin from the freezer and threw it all on the grill. DennyMike's Cue Stuff as my pre-oven rub and tried a new rib-cooking technique. 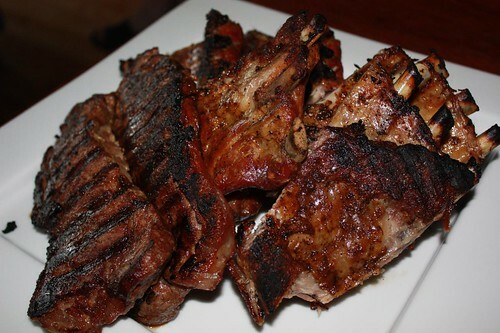 I slow-roasted the ribs at 300 degrees for 90 minutes then turned off the oven and let them cook an additional 30 minutes before removing them, letting them come to room teperature then finishing them on the grill. 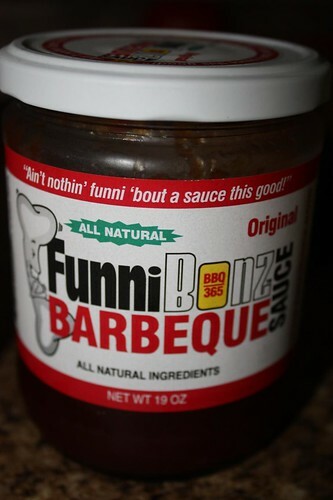 I got this jar of FunniBonz barbecue sauce about a year ago when we still lived in the city with homes that maybe, one day, we'd be able to make ribs. Today that dream came true. I find that dreaming really, really small is the secret to true happiness in life. 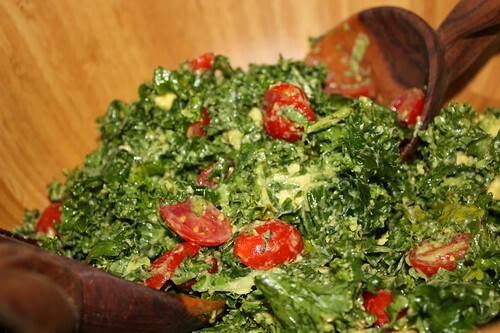 I also chopped up the remaining kale and made this salad with olive oil, lime, avocado, tomato, a touch of cayenne, salt, and pepper. 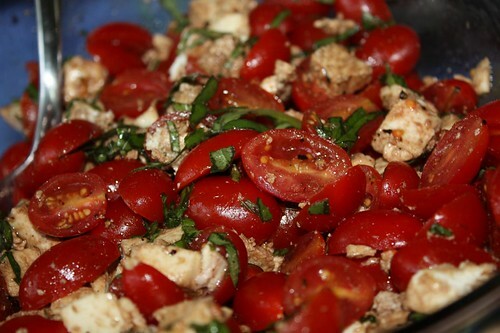 With some of the leaves from the basil plant I tossed together some tomato, mozzarella, olive oil, balsamic, sald, and pepper. 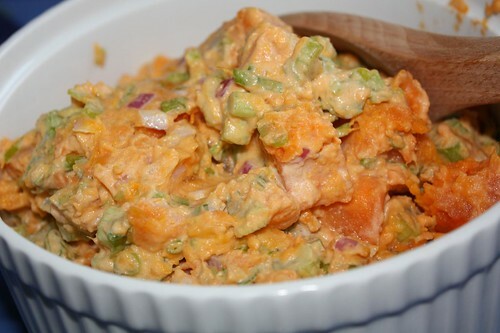 For this salad I cooked some sweet potatoes until just tender, chilled them, tossed with dijon, mayonnaise, red onion, green onion, celery, cayenne, Old Bay, salt, and pepper. I made way too much food but that didn't prevent me from purchasing a gigantic wedge of cornbread! 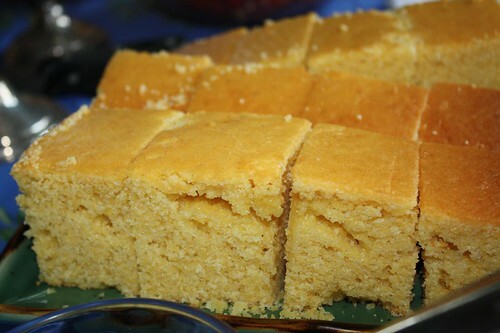 I sometimes feel guilty about not making my own cornbread but then I think about running the oven on a hot day and the fact that buying it already made only costs about two dollars. Then I feel much better. We opted to go to Longford's, as we often do, in lieu of making our own dessert. I don't know if there are any creative ways that I'll come up with for utilizing most of this stuff so it may be quiet on the blog front for this first week of June. Apparently our local farmer's market just started back up on May 30th (which we missed) so we will likely return soon to our roots. Since we don't have the exorbitant fees to sign up for a farm share around here we'll be buying our produce a la carte. 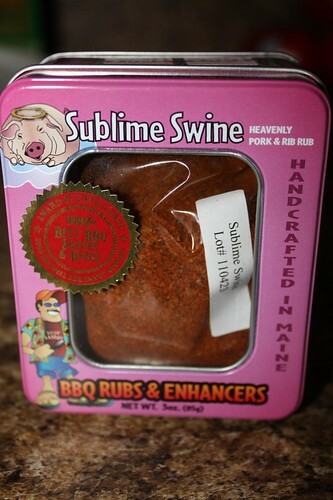 I still remember the BBQ you had down in Providence I went to. Mmm.. that was tasty! Hey, let us know a) when you make too much food and b) when you go to Longford's! We'll meet ya for some ice cream! Aw yeah! It's a Longford's date!